The decision to close schools when adverse weather conditions are present will be made by the Superintendent. Every attempt will be made to finalize the decision regarding school closings no later than 5:00 a.m. Please tune in to local television stations, radio stations and the District Website for closing notifications. Information will also be shared through the parent automated notification system, Facebook, Twitter and our District Mobile App. Please reference the following locations for designated tornado shelters in our communities. 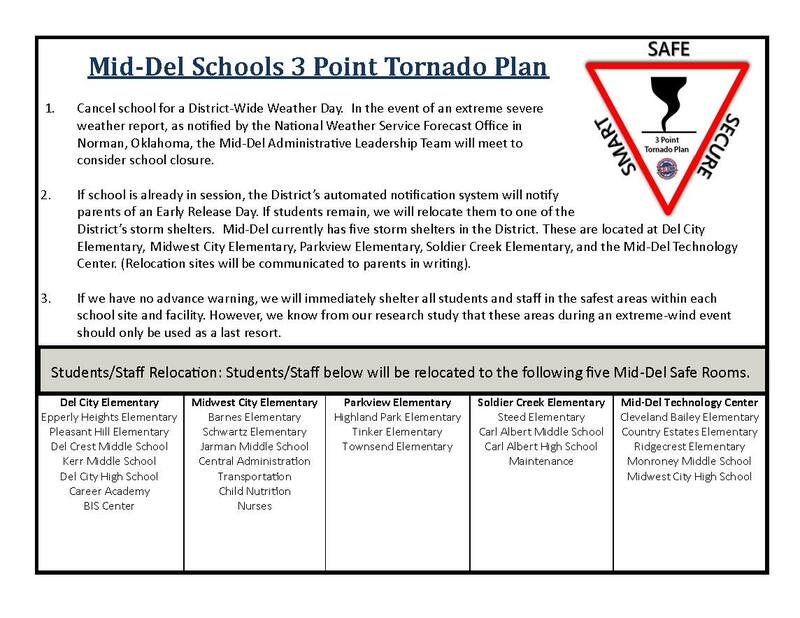 Mid-Del Schools does not have any Public Designated Storm Shelters. The Designated City Storm Shelters open as the City sounds the storm warning sirens. Click on the 3 Point Tornado Sheltering Plan Image for our District's sheltering information to be used during school hours. City of Del City: **NO Designated City Storm Shelters. City of Oklahoma City: **NO Designated City Storm Shelters.